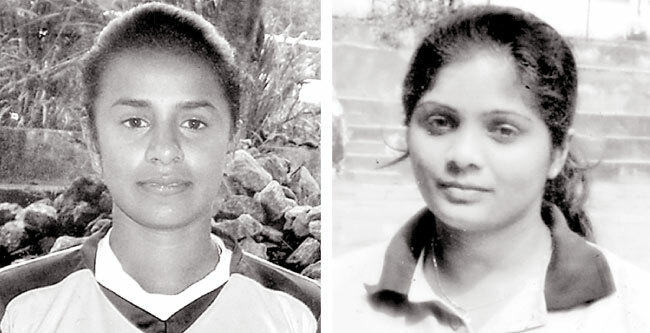 Centre forward Madura Dharmaratne of Sri Lanka Navy will lead Sri Lanka women’s team at the first ever South Asian Games Ladies Hockey Championship in Guwahati India this month. Her deputy will be goal keeper Jeewanthi Keerthiratne. Madura Dharmaratne is a product of Seetha Devi Balika Vidyalaya, Kandy where she came under the guidance of that veteran coach. M.A.M. Ashroof who sharpened her skills and made her a fearsome forward. She hails from a village in the Yatinuwara electorate where is hardly any sport but made her mark at school. A fearsome centre forward she was adjudged the “Best Player of the Tournament” at the National Sports Festival Ladies Hockey Championship 2015 representing the Central Province who ended up as the champions in a tournament which was largely dominated by the stickers from the Central province who won the finals 7-0 against Western Province. Madura Dharmaraten played for Seetha Balika Vidyalaya as a centre forward at all age group levels and captained the school in her final year in 2006 which won several championship titles. She also captained the school in the junior level and also the Central Province Schools. She has been an automatic choice to the national team for the last six yeas and was its vice captain in 2014 she also won Sri Lanka Schoools Colours in 2005 and 2006. She has represented the country at the World League and the Asian Championships besides many other international tours. Stockily but soft spoken Jeewanthika Keerthiratne who is the custodian of the team is the deputy skipper. She took to goal keeping under unexpected circumstances. When she was an essentially a center forward. When she was around 18 years, the regular goal keeper of the wchool was injured and she played in this position as a stop gap and from that day she has been playing in this position and is the undisputed Sri Lanka number one goal keeper for the last seven years.